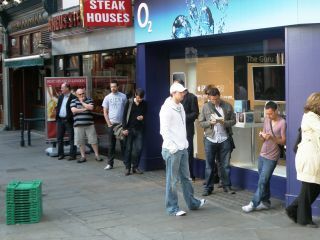 O2 has told TechRadar that it stood firm on not allowing iPhone 3G users to upgrade early to the 3G S in a similar way to US counterpart AT&T because it wanted to be fair to all its customers. "We feel strongly that there shouldn't be one set of rules for one set of customers, and another set for the others. It's only fair that we have good policies and treat all our customers fairly," said Steve Alder, General Manager of Devices for O2 UK. This was after AT&T in the US, the country's exclusive carrier, let users on high-spend plans upgrade up to three months earlier than usual. O2 has a similar scheme, but the earliest users will be able to upgrade to the new iPhone is July / August. "It's difficult to co-ordinate contracts around the launch of the new iPhones, especially as we're seeing huge numbers [of new contracts] throughout the year." Some users have called for the re-introduction of 12-month contracts on the iPhone, with a higher early charge, in order to get the new iPhone each year. But Alder said that it wasn't really the trend for users, and also ruled out TechRadar's (frankly brilliant) suggestion that perhaps it should have an 'iPhone lovers'' contract, where a higher price is paid in order to get the new phone every a newer model appears. "We used to have 12-month contracts, but now we're finding that more people are trending towards 18- and 24-month contracts, with the latter especially picking up. "We're open to any ideas [ie the iPhone lovers' contract] and we listen to our customers and take any new ideas on board, though we haven't heard that idea as yet..."
He was also unconcerned about the lack of queuing this year outside the stores, which he said he was expecting, especially as hundreds of thousands of O2 customers has already upgraded to the iPhone 3.0 firmware, which is a strong indication that they wouldn't be buying the iPhone 3G S.
Even still, O2 has said it experienced ten times the usual footfall for an average day in store. "[The footfall] is what we're expecting, a lower amount to the iPhone 3G, and we didn't think we were going to get that kind of interest."